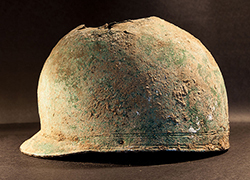 A helmet discovered in farmland near Canterbury in September 2012, that archaeologists from the Department of Classical and Archaeological Studies helped to confirm as dating back to the 1st century BC, is to be permanently displayed at the Canterbury Roman Museum. The rare warrior's or soldier's helmet is made of bronze and was found alongside a brooch by an amateur metal detectorist. Working with Canterbury Archaeological Trust, the helmet was scanned by archaeologists from the Department, using state-of-the-art technology to help define its history. Experts from the British Museum have identified it as a Coolus-type helmet, made on the Continent, probably in Gaul (modern-day France). Helmets like this were designed to protect the head from attack by swords, spears, axes and arrows. They also helped protect soldiers from sunstroke and sunburn. The helmet was beaten out of a single sheet of metal. The surface is smooth, apart from two parallel lines of incised, cable decoration around the rim. Holes around the rim were fastening points for a leather chin strap which has long since rotted away. 3D laser scanning of the helmet carried out on campus has resulted in a detailed, three-dimensional computer model of the helmet, which can be replicated through 3D printing in a range of materials. A resin copy has been created in this way for the museum handling collection.